Helsinki is the most visited by tourist’s city in Finland. According to border guards, about 4.9 million arrived in Finland foreign tourists pointed out visit to Helsinki as the purpose of there trip in 2015. (A total number of tourists was 7.4 million people in Finland in 2015.) Approximately 13% of them were Russian citizens. According to statistics, most of the tourists visited the amusement park Linnanmäki, Helsinki Zoo, Suomenlinna Fortress, museums and attractions. Places to visit (sights, museums). Where to stay in Helsinki (hotels, hostels, camping). How to get to Helsinki. Tourists arrive to Helsinki by using different modes of transport. Helsinki City Airport handled 16.42 million passengers in 2015. Passenger Port of Helsinki has served 12 million passengers. Cruise liners have brought in Helsinki 437 000 tourists. A resident of Russia often travel to Finland by cars, buses and trains. Allegro high-speed train is the fastest way to travel between St. Petersburg and Helsinki. Traveler’s number can be indirectly estimated on the number of customers in hotels. 3.5 million overnight stays were registered in hotels in Helsinki in 2015. Foreigners and locals accounted for about 50% of the total number of hotel customers. The largest number of customers came from Germany. The following sources of tourists in the ranking are Russia, United Kingdom, Sweden, Japan and China. Approximately 52% of hotels clients came for tourism and 48% for business purposes. Helsinki is located in the southern part of Finland, on the shore of the Gulf of Finland. The city is located approximately 280 kilometers west of St. Petersburg, about 370 kilometers east of Stockholm and 80 kilometers north of Tallinn. You can check Helsinki location on the Finland map. Helsinki is the capital of Finland and the largest city in Finland. Population of Helsinki is about 600,000 people. The population of Helsinki metropolitan area with the closest cities (Espoo, Vantaa and Kauniainen) is about 1.3 million people. There are more than ten of higher education institutions in Helsinki. It is easy to get to Stockholm, Tallinn, St. Petersburg or Moscow from Helsinki. Helsinki Vantaa Airport connects the city with many major European cities. Helsinki is often chosen as the main point of trip to Finland by foreign tourists. Helsinki took first place in the ranking of the 25 best cities in the world by the British magazine Monocle in 2011. Helsinki is divided into eight administrative districts. The Southern District of Helsinki is the most interesting for tourists. It is the historical city center with most of interesting places for tourists located here. Places of interest located in the city centre: The Presidential Palace, the Palace of Government, Senate Square, Cathedral, Cathedral of the Assumption, the Bank of Finland, Helsinki University main building, Sokos and Stockmann department stores, Kiasma and Ateneum museums, Musiikkitalo concert hall. Helsinki City Museum – 242,7. Museum of Contemporary Art Kiasma – 165,1. National Museum of Finland (Suomen kansallismuseo) – 107,4. Art Museum of Helsinki - 82,8. Sinebrychoff Art Museum – 33,5. Number of pools - 14. Number of beaches - 27. Number of parking for boats, yachts and boats - 12000. St. Petersburg (by car) - 390 km. There is a lot of interesting for people with different interests in Helsinki. Despite the short history (compared with the oldest cities in Europe), there are a lot of interesting sights and architectural objects in Helsinki. There are many interesting museums too. Large shopping malls and small shops operate in Helsinki for lovers of shopping. There is a zoo, amusement park and water park for families with children. The city center is the best point to start discovering Helsinki. You can start Helsinki self-guided sightseeing tour at the Senate Square. Senate Square is located at a distance about 150 meters from the shore of the bay and cruise ships terminals. Kaisaniemi is the nearest metro station located at a distance of about 300 meters from Senate Square. The Senate Square is number one of the most visited places in Helsinki. It often hosts various interesting for tourists and city residents’ events. The face of the Senate Square of Helsinki was created largely by the famous architect Karl-Ludwig Engel. The Helsinki Cathedral is situated on the north side of the square (Cathedral of St. Nicholas, Helsingin tuomiokirkko). It is the most recognizable building in the city and the main symbol the Helsinki. Emperor Alexander II monument located in front of the cathedral. State Council building is located on the eastern side of the square. Currently, the building is the residence of the Prime Minister and the Government of Finland. On the contrary the State Council Buildings is located the University of Helsinki main building and the National Library. There are some places located to the south of the Senate Square: Helsinki City Museum, Town Hall, Art Gallery “Virka Galleria”, information center “Virka Info”. Helsinki Market Square is located to south of this area, near the bay. 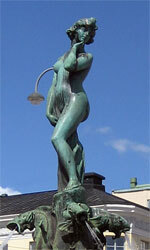 The most famous sculpture in Helsinki, Havis Amanda, is located near the square, at the intersection of streets Unioninkatu and North and South Esplanade. It is possible to get to the Esplanade Park, after a short walk to the west of this place. Esplanade Park is located between North and South Esplanade streets. It is a favorite place for meetings and walking for Helsinki residents and tourists. Going from the Senate Square to the east along the street Aleksanterinkatu can reach (the distance of 200 meters) the waterfront. Here on Cape Katajanokka is located Uspensky Cathedral. Not far from this place departs ferries to Stockholm. Popular with tourists also are fortress Suomenlinna, Finland's largest amusement park Linnanmäki, Zoo Helsinki Zoo on the Korkeasaari island. Helsinki Railway Station is located at a distance less than 500 meters from the Senate Square. A nice way to quickly get acquainted with sights of the city of Helsinki is a tram route 3T. There are major city attractions, situated along the tram route: church at Temple Square (Temppeliaukionkirkko), Olympic Stadium, the National Opera House, Senate Square. Tourists can start a tram tour, for example, from the Market Square or Central Railway station. Trip duration is about 1 hour. Learn more about Helsinki attractions. "Ateneum" Art Museum is the national art gallery of Finland. Works of Finland artists and works of European art are collected here. The museum is located near the central railway station. On the other side of the station building is located the Museum of Contemporary Art “Kiasma”. The museum is trying to trace the development of all the latest trends in art. The National Museum of Finland is located a little further to north, at the address Mannerheimintie 34. Museum introduces the history of the Finns, ranging from prehistoric times to the present day. There is Museum of Natural Science located just east of the Kiasma museum in Helsinki. Here you can learn more about the nature of Finland and the Baltic Sea. The Design Museum is also popular in Helsinki. Suomenlinna fortress and museum is located near the town on the island. It is one of the most visited places of the city (mainly in summer). Learn more about Helsinki museums. There are good shopping opportunities in Helsinki. The most popular shopping streets are: Aleksanterinkatu, South and North Esplanade. There are many different stores around these streets. Many popular shops are located in major shopping centers. Forum Shopping Center is located next to the Central railway station of Helsinki. Kamppi shopping center is located a little further, at a distance of about 500 meters from the train station (near Kamppi metro station). The most popular department store Stockmann is situated near the railway station, at the intersection of Aleksanterinkatu and Mannerheimintie. ITIS shopping mall is the largest in the city (Itis, formerly Ityäkeskus). It is located in the eastern part of Helsinki. Itäkeskus is the nearest metro station. There are also other shopping centers in Helsinki (Selo, Iso Omena, Ikea). There are a lot of events interesting for tourists held in Helsinki every year. Only some of them are mentioned here. If you will be in Helsinki in these days, try not to miss these events. Helsinki City Day is held annually on June 12. A lot interesting events are organized on this day for residents and tourists in many parts of the city. A concert in the Kaivopuisto Park can be considered as the biggest event of the Helsinki City Day (Kaivopuiston kesäkonsertti). The biggest rock festival in Finland, Tuska Open Air Metal Festival is held in late June or early July in the Suvilahti. It's the biggest rock festival in northern Europe. The Helsinki Festival is perhaps the most famous event in Helsinki (Helsingin Juhlaviikot). The Helsinki Festival weeks are held in late summer, in August - September in many places in the city. A lot of different events are carried at this time. Visitors can meet arts in all their diversity in Helsinki during the festival: classical music, dance, drama, opera and more. These events will be interesting for many tourists. Love and Anarchy (Rakkautta ja Anarkiaa, Helsinki International Film Festival Rakkautta & Anarkiaa) is a Film Festival taking place in September in Helsinki. It is the biggest cinema event in Finland. The festival promotes the visually stunning and controversial new films, revealing the promising talents of tomorrow. Films from around the world ere presented at the festival. Christmas Lights Switch On event. Preparation for Christmas begins with Christmas lights switch on event is held on Aleksanterinkatu street. Festivities begin at the Senate Square on afternoon November 25. Christmas lights switching on is the culmination of the ceremony. It will be held at 15 o'clock on the Aleksanterinkatu Street. You can better plan the route of walk in Helsinki with the help of the city map. In Helsinki, there is a sufficient number of hotels of various price and comfort levels. The most popular hotels are located in the city center, near the railway station and the passenger port. The airport, exhibition center and sports arenas are зopular places, near which often book hotels. Take a look at the reviews for hotels located near popular destinations in Helsinki. There are two large water parks in Helsinki: Serena and Flamingo. They are especially popular in winter. You need to be a resident of the northern country to understand the pleasure of visiting the water park in the winter. Residents of Finland like to rent a hotel room near the water park and spend a few days with pleasure. Learn more about hotels in Helsinki. There is also a camping near Helsinki. Camping Rastila is located about 12 kilometers from the center, near the beach. There are places for tents, motor homes, as well as small cottages. You can book a place in the campsite through the hotel reservation service. Helsinki can be reached by using different types of transport. The choice of transport depends on the place of your departure. The aircraft will be the best (and the only) mode of transport to get to Helsinki from most European cities (as well as America and Asia). Direct flights to Helsinki are carried out from many European cities. There are also flights with a stopover in Riga, Stockholm and other airports. You can easily find a suitable flight for you, using the service of airline tickets search. If you do not like flying in airplanes, then you can get to Helsinki by sea. Helsinki has a regular ferry service to Stockholm and Tallinn. You can easily get to the capital of Finland by sea from these cities. Helsinki has good transport connections with Moscow and St. Petersburg. It is most convenient to travel from Moscow to Helsinki by rail. Trains depart from the Leningradskiy railway station in Moscow and arrive at the central station in the center of Helsinki. From St. Petersburg to Helsinki you can get by rail and by bus. High-speed trains leave from Finlyandsky Railway Station in St. Petersburg. The journey takes about 4 hours. This is more convenient than by an airplane. Bus transport between St. Petersburg and Helsinki is performed by several transport companies. The bus station in St. Petersburg is located near the metro station "Obvodny Canal". The Helsinki Bus Terminal is located in the Kamppi shopping center.